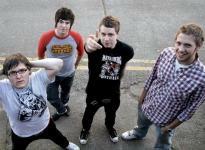 The song 'You And Me' by Welsh rockers Attack! Attack! has been announced as the latest addition to the 5th Guitar Hero game. The band were voted in by a panel of music professionals and beat over 200 other competitors to win the exciting prize. The competition, MIDEM 2009, ran from 18th - 21st of January and has been used in previous years to discover up-and-coming new talent. The contest last year secured The Answer a track on the previous Guitar Hero World Tour game. Frontman, Neil Starr, commented that the band were all fans of the game and that he knows "what Charlie felt like now when he found the last golden ticket to Willy Wonka's chocolate factory!". Good news for the band continued as they found out one of their songs was to be played on the hit new TV show, 90210. The band are currently on their headline tour and will release their next download-only song on 18th May.